"The Christian ideal has not been tried and found wanting. It has been found difficult; and left untried." Gilbert Keith Chesterton (1874-1936) cannot be summed up in one sentence. Nor in one paragraph. In fact, in spite of the fine biographies that have been written of him, he has never been captured between the covers of one book. But rather than waiting to separate the goats from the sheep, let’s just come right out and say it: G.K. Chesterton was the best writer of the 20th century. He said something about everything and he said it better than anybody else. But he was no mere wordsmith. He was very good at expressing himself, but more importantly, he had something very good to express. The reason he was the greatest writer of the 20th century was because he was also the greatest thinker of the 20th century. Chesterton was equally at ease with literary and social criticism, history, politics, economics, philosophy, and theology. His style is unmistakable, always marked by humility, consistency, paradox, wit, and wonder. His writing remains as timely and as timeless today as when it first appeared, even though much of it was published in throw away papers. This man who composed such profound and perfect lines as “The Christian ideal has not been tried and found wanting; it has been found difficult and left untried,” stood 6’4″ and weighed about 300 pounds, usually had a cigar in his mouth, and walked around wearing a cape and a crumpled hat, tiny glasses pinched to the end of his nose, swordstick in hand, laughter blowing through his moustache. And usually had no idea where or when his next appointment was. He did much of his writing in train stations, since he usually missed the train he was supposed to catch. In one famous anecdote, he wired his wife, saying, “Am at Market Harborough. Where ought I to be?” His faithful wife, Frances, attended to all the details of his life, since he continually proved he had no way of doing it himself. She was later assisted by a secretary, Dorothy Collins, who became the couple’s surrogate daughter, and went on to become the writer’s literary executrix, continuing to make his work available after his death. I consider it as being without possible comparison the best book ever written on St. Thomas. Nothing short of genius can account for such an achievement. Everybody will no doubt admit that it is a ‘clever’ book, but the few readers who have spent twenty or thirty years in studying St. Thomas…cannot fail to perceive that the so-called ‘wit’ of Chesterton has put their scholarship to shame. He has guessed all that which we had tried to demonstrate, and he has said all that which they were more or less clumsily attempting to express in academic formulas. 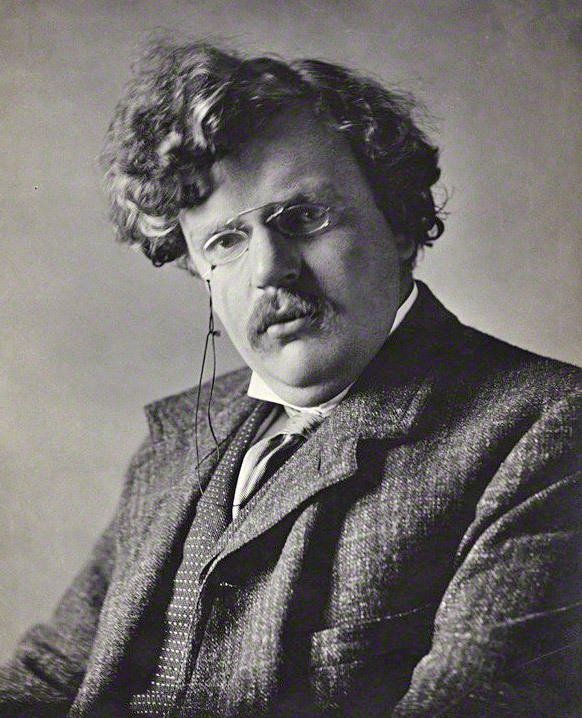 Chesterton was one of the deepest thinkers who ever existed; he was deep because he was right; and he could not help being right; but he could not either help being modest and charitable, so he left it to those who could understand him to know that he was right, and deep; to the others, he apologized for being right, and he made up for being deep by being witty. That is all they can see of him. His writing has been praised by Ernest Hemingway, Graham Greene, Evelyn Waugh, Jorge Luis Borges, Gabriel Garcia Marquez, Karel Capek, Marshall McLuhan, Paul Claudel, Dorothy L. Sayers, Agatha Christie, Sigrid Undset, Ronald Knox, Kingsley Amis, W.H. Auden, Anthony Burgess, E.F. Schumacher, Neil Gaiman, and Orson Welles. To name a few. “…and why haven’t I heard of him? Why haven’t you heard of him? Chesterton is the most unjustly neglected writer of our time. Perhaps it is proof that education is too important to be left to educators and that publishing is too important to be left to publishers, but there is no excuse why Chesterton is no longer taught in our schools and why his writing is not more widely reprinted and especially included in college anthologies. Well, there is an excuse. It seems that Chesterton is tough to pigeonhole, and if a writer cannot be quickly consigned to a category, or to one-word description, he risks falling through the cracks. Even if he weighs three hundred pounds. But there is another problem. Modern thinkers and commentators and critics have found it much more convenient to ignore Chesterton rather than to engage him in an argument, because to argue with Chesterton is to lose. Chesterton argued eloquently against all the trends that eventually took over the 20th century: materialism, scientific determinism, moral relativism, and spineless agnosticism. He also argued against both socialism and capitalism and showed why they have both been the enemies of freedom and justice in modern society. And what did he argue for? What was it he defended? He defended “the common man” and common sense. He defended the poor. He defended the family. He defended beauty. And he defended Christianity and the Catholic Faith. These don’t play well in the classroom, in the media, or in the public arena. And that is probably why he is neglected. The modern world prefers writers who are snobs, who have exotic and bizarre ideas, who glorify decadence, who scoff at Christianity, who deny the dignity of the poor, and who think freedom means no responsibility. But even though Chesterton is no longer taught in schools, you cannot consider yourself educated until you have thoroughly read Chesterton. And furthermore, thoroughly reading Chesterton is almost a complete education in itself. Chesterton is indeed a teacher, and the best kind. He doesn’t merely astonish you. He doesn’t just perform the wonder of making you think. He goes beyond that. He makes you laugh. This is not our work. It can be found here.